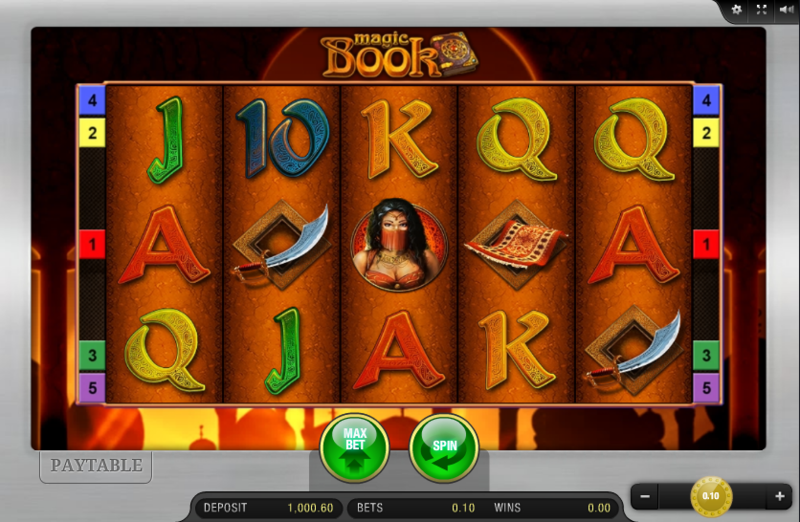 Join us once more as we head back in time and back to the Middle East to check out this online slot machine from Bally Wulff; veiled maidens, curved swords and magic carpets await, along with some free spins so read on for all the essential details about Magic Book. Magic Book is a five reel slot with three rows and twenty fixed paylines; the design of the game is similar to other Bally Wulff games with the reels spinning inside a simple frame placed against a background of domes roofs and minarets silhouetted in front of a rising sun. The high value symbols include the male and female characters in this story, a scimitar and a magic carpet; 10, J, Q, K and a represent the lower values. The wild and the scatter symbols is one and the same and of course it’s the Magic Book which will substitute for all others to form winning combos. 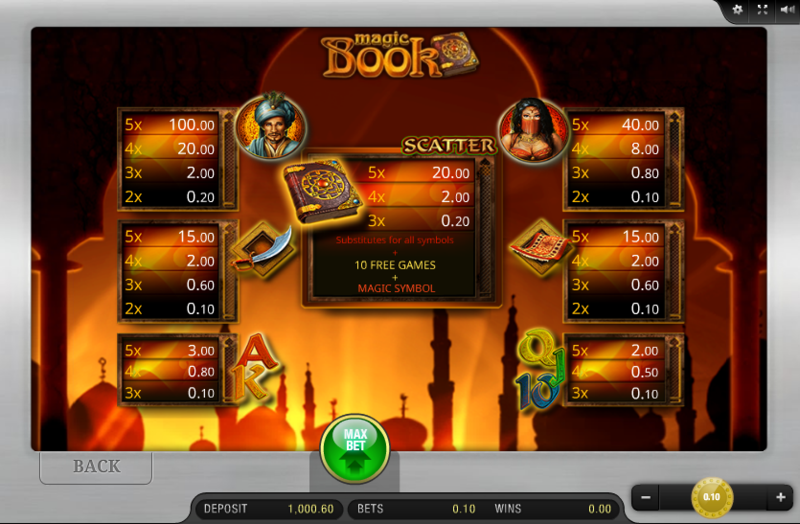 This is triggered by landing three or more of the Magic Book wild/scatter symbols anywhere in view and you will be rewarded with ten free spins but first a magic symbol is picked randomly from the standard ones; landing at least two of these magic symbols will cause them to expand and fill the entire reel, effectively creating a wild reel and lots of scatters. Spins can be retriggered by landing more Magic Books during this round. Magic Book is quite similar to other Bally Wulff slots in terms of design and gameplay but at least you know what you’re getting; the free spins round offers something extra with the magic symbol and there’s an RTP of 96.18%.